GOVERNMENT has said the MDC Alliance and its leadership will be held accountable if their planned demonstration on Thursday results in loss of life and limb or damage to property. MDC Alliance leader Mr Nelson Chamisa – who last week branded “stupid” demonstrators who took part in the August 1 demonstrations that left six dead and damaged property — said his party would march against Government on Thursday. It emerged yesterday that the planned protests have nothing to do with economic issues, but are meant to pressure President Mnangagwa and Zanu-PF to share power with Mr Chamisa and his party. 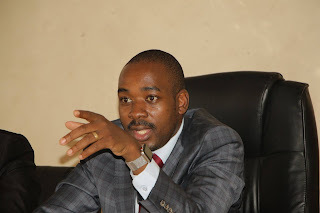 Mr Chamisa told London-based international news magazine, The Guardian Weekly that his Thursday protests would call for a “transitional authority” to “move the country forward”. Deputy Chief Secretary to the President and Cabinet (Presidential Communications), who is also the Presidential spokesperson, Mr George Charamba, yesterday said the onus was on the opposition political outfit to ensure there was no injury to life and damage to property. “Section 59 of the Constitution is very clear, it confers the right to demonstrate on all Zimbabweans,” he said. “There is no intention of withdrawing that constitutional right except there is a qualification on that right both at the level of the Constitution and subsidiary law. “Apparently, our laws place a burden on the organisers of that demonstration to make sure there is no injury to life, limb or property. In the event of any damage at whatever level, the onus is on the organisers and that must be known fully by the MDC Alliance. Mr Charamba said certain protected areas will be no go areas for opposition supporters. In November last year when Zimbabweans demonstrated against former President Mr Robert Mugabe, security forces were on alert and barred people from entering protected areas like State House. Mr Charamba went on: “This country has a precedent of abuse of Section 59 by way of events of August 1 for which a whole international Commission of Inquiry has been set up. “Government has taken note of statements from MDC Alliance leader (Mr Chamisa) to say that nations are built on love and unity and we hope that being a pastor, he will live the verse,” he said. Security agencies have said they are ready to deal with anyone found breaking the law.